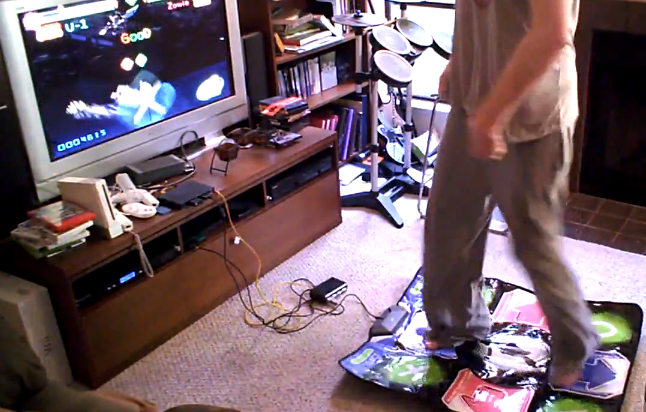 Enjoy retro N64 games, but can’t stand the controller? That’s the situation I found myself in about 7 years ago, back in 2004. 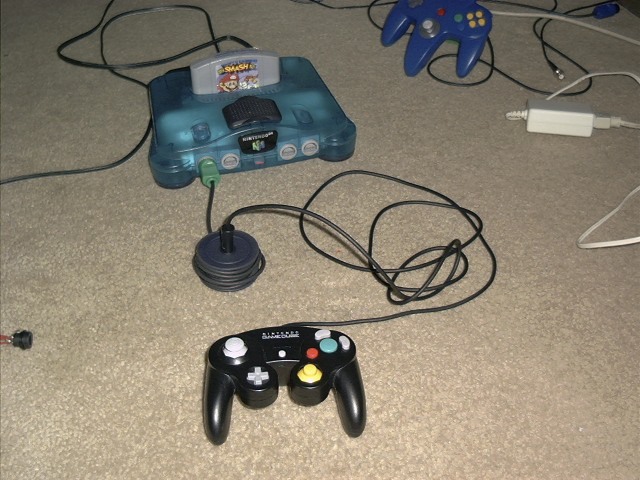 So I built an adaptor, to use Game Cube controllers on the N64. 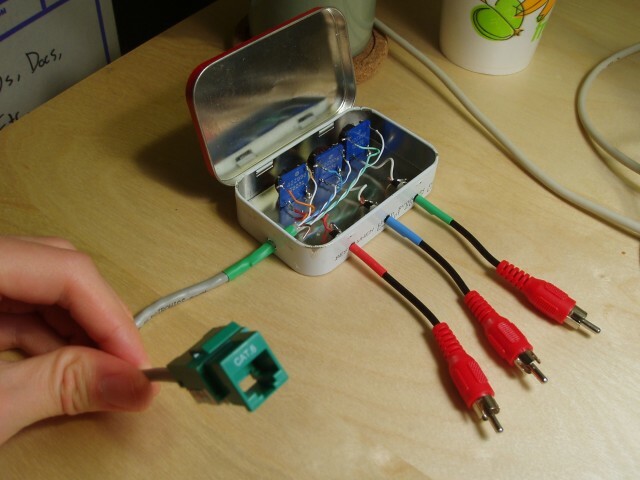 The adaptor hardware is very simple- all you need is a PIC microcontroller. I originally designed the project to work with the very popular at the time PIC16F84A, or some smaller 8-pin chips. It bit-bangs both protocols, so you don’t need any more hardware than a tiny µC, a couple resistors, and optionally either a voltage booster or battery pack to run the “rumble” vibration motor. I had a lot of fun building it, since it was an opportunity to reverse engineer a protocol that, as far as I could tell, had never been documented publicly. There were many web sites explaining the basics of the N64 and Game Cube protocols- enough to talk to the controllers with your own hardware. But there was significantly more to learn about emulating an N64 controller, since there are many features that you don’t really need to use the controller, but which games will use. The N64 also has the added complexity of having a memory card slot. 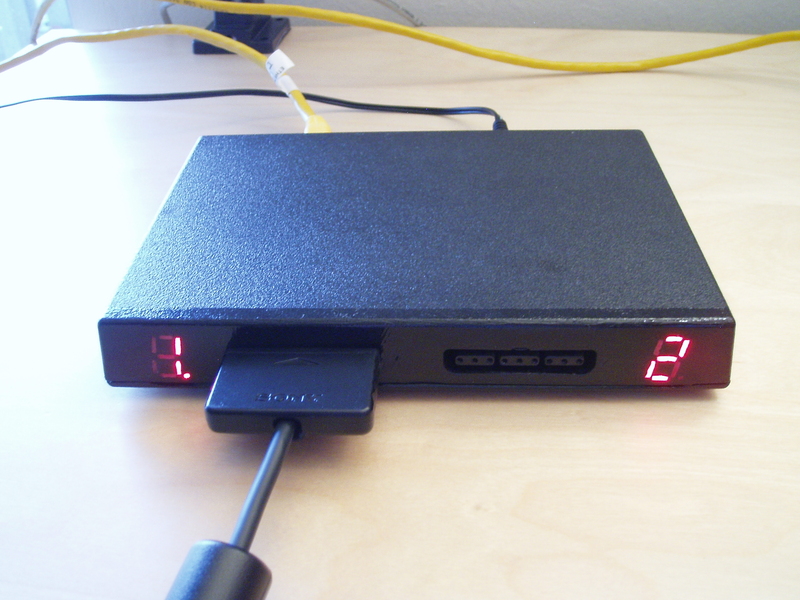 The controller implements a protocol that tunnels SRAM reads/writes over the controller wire. Peripherals like the Rumble Pak pretend to be SRAM, but are actually memory-mapped I/O devices. This is a very old project, but I thought I’d do a quick post with an update on it. I never really released the project, I just quietly posted the source code and the CIA feed. Since then, many others have found the project and built their own. I recently heard from Jacques Gagnon, who went a step farther. He was frustrated by a few lingering bugs, most notably lack of support for the WaveBird wireless controllers. So he pulled the project into Google Code and has been hacking away! WaveBird controllers work now, and he’s added several other new features, such as the ability to store multiple sets of button mapping layouts in memory. If you’re still interested in this classic gaming platform and you’d love to have your own Cube64 adaptor, I highly encourage you to check out Jacques’ work. The adaptors are easy to build, especially if you already have some experience with microcontroller programming. 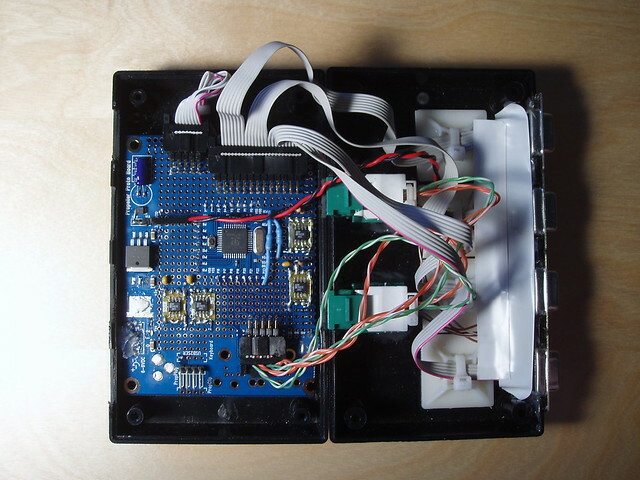 This entry was posted in Projects, Unicone and tagged bit-banging, console project, emulation, microcontroller, mini-project, nintendo, reverse engineering on March 30, 2011 by Micah. Anyway, this device has been working really well for Paul and I, and we’ve made good use of it. I wasn’t sure if anyone else had noticed my docs and code, though, or found them useful. Well, recently I heard from Julian Bleecker, who is using my emulator for a pretty nifty project. He also pointed out a very well-organized guide to the Playstation controller protocol, which prominently sites my reverse-engineering work. Cool. If you’re interested in interfacing anything with a Playstation or a Playstation controller, I highly recommend this guide. It includes information about all of the advanced configuration commands I reverse-engineered, plus it includes all of the basic electrical information that my little document totally glossed over. It sites multiple sources, and they have independently verified everything and provided their own protocol traces. This entry was posted in Unicone and tagged console, controller, documentation, playstation, reverse engineering on July 9, 2008 by Micah. The little hardware project I started almost 2 months ago is finally done. Completely finished. Bug free! Well, almost. It is, however, in a fully assembled state with firmware that is actually pretty usable. The Unicone2 is the result of my mini-quest to extend Playstation 2 controllers over long lengths of cat5 cable. 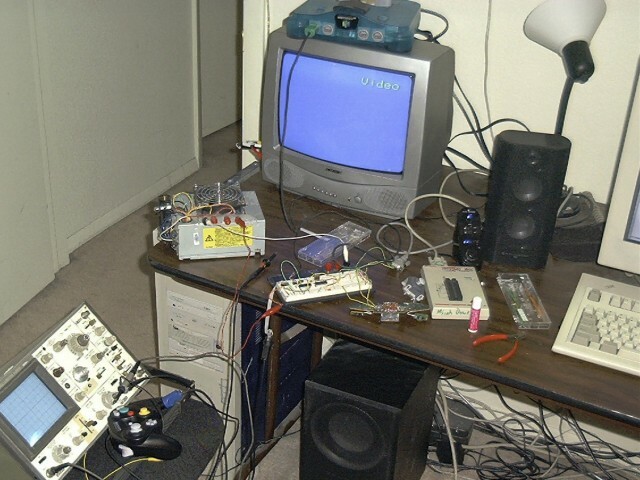 A while back I did something similar, extending Game Cube and N64 controllers over ethernet. 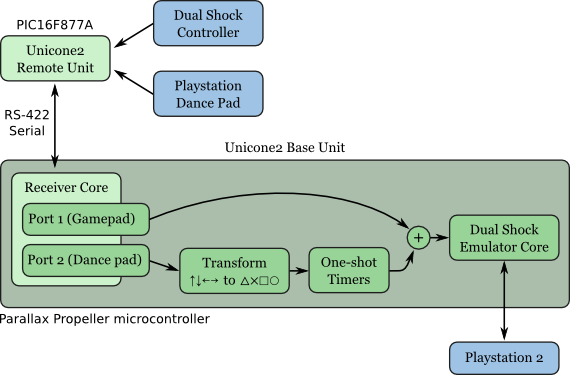 That was the original Universal Controller Emulator, or Unicone. It used an FPGA, and a pair of Linux boxes. This time the design focus is low-latency, no PC required, and full support for Playstation 2 Dual Shock controllers and the Guitar Hero controller. The Unicone2 went through a few redesigns before I settled on something I liked. The final version is based on a pair of microcontrollers and an asymmetric RS-422 link over cat5 cable. The remote end, where the physical controllers live, runs a PIC16F877A microcontroller. The base station, where all the consoles sit, uses the awesome Parallax Propeller, an 8-core microcontroller. The remote unit’s job is pretty simple. It initializes and polls its two controllers, attempting to maintain a constant polling rate. The controller data is streamed over a very low-latency 250kbps RS-422 link. In its spare time, the PIC reads lower-bandwidth data (LED status, force feedback state) over an incoming 19200-baud RS-422 link. The base station has a much harder job. 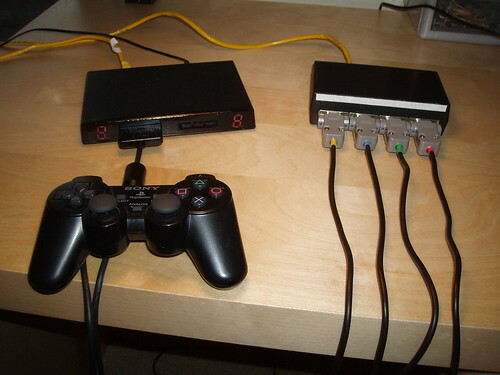 It needs to emulate four controllers and receive data from two remote units simultaneously. These are all high-speed (250 to 500 kbps) asynchronous serial streams, with no flow control. It’s pretty much an intractable workload for most microcontrollers. I spent a long time trying to solve this problem with an FPGA, just like I did with the original Unicone project. This was working okay, but it was tedious. Playstation 2 controllers are even more complex than N64 controllers, and the problem doesn’t map well to the hardware domain. When I first read about the Propeller, it seemed like a perfect solution to this problem. Just write one controller emulator, and run four copies of it simultaneously on different processors. The controller emulators and the RS-422 receivers communicate over shared memory, making the whole device quite low-latency. This also leaves plenty of CPU power and memory to emulate other flavours of video game controller, as well as leaving space to implement special effects like controller mixing and synchronized record/replay of controller events. I’ll end the hardware rambling for today. Paul or I might have to post soon with some more info about the gameplay implications of the Unicone2. Besides acting as an extender, it can already act as a controller crossbar switch and mixer, which will let us experiment with improvised multiplayer action on single-player games. More photos of the Unicone2 are on my gallery. Firmware and schematics are in Subversion. 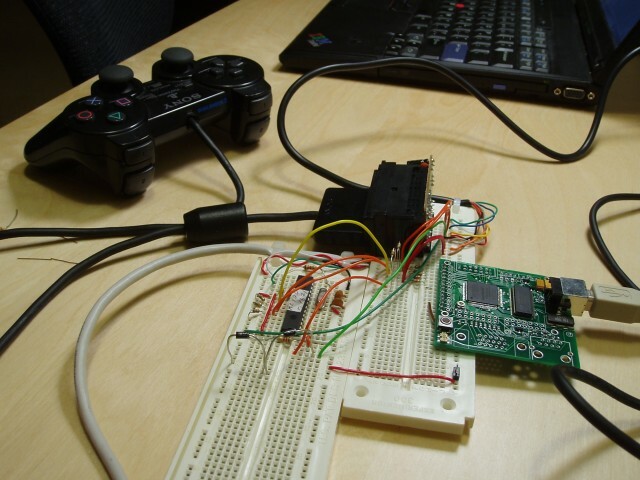 This entry was posted in Portfolio, Unicone and tagged extensible project, microcontroller, playstation, polished project, propeller, real-time, reverse engineering, unicone2 on August 4, 2007 by Micah.